Fremont resident and mother Ruth alerted Fremont Universe that her daughter was involved in a luring incident late last week. KOMO news briefly covered the incident here. Two men tried to lure her 13 year old daughter into their dark green Suburban last Thursday March 5th around 3pm on the premise of showing her their puppies. The girl was approached on the 4300 block of Palatine Ave North. Ruth says her daughter “ran and got help from one of our neighbors who called the police.” The police did not find the luring suspects. A suspect has been arrested after what police are calling a drive-by shooting early yesterday morning. At approximately 4:30 a.m., the 911 call center received multiple reports of hearing six to eight gunshots in the 4300 block of 5th Ave NW. A witness gave police the description of the vehicle and driver, which he had also seen and taken note of in the area a few days earlier. A vehicle parked in front of a witness’s house had multiple bullet holes and police recovered shell casings and slugs, police say. There were no injuries and no apparent damage to the home. Officers responded to the suspect vehicle’s registered address and observed the vehicle parked/unoccupied outside, with one shell casing visible on the rear seat floorboards. While watching the residence, another vehicle left the house. Officers stopped this vehicle and detained the male matching the suspect description. He was positively identified by the witness to the earlier shooting. The suspect was subsequently booked into King County Jail for Investigation of Drive-by shooting. The suspect’s vehicle was impounded to the processing room. Terrie Johnston, crime prevention coordinator for Seattle Police Department’s North Precinct, recently sent an update to all Block Watch captains about crime trends in North Seattle. Johnston said most August burglaries occurred during daytime hours, many of them before noon. The bulk of the entries are non-forced through open or unlocked doors and windows. (Still a few through dog-doors as previously reported) I noticed several entries through unlocked garage doors, which can be harder to protect. If you can access your home through the garage, please think of the door between the garage and house as an exterior door. They should be solid; wooden or metal with good deadbolt lock and a door frame that is anchored into the wall studs. Window screens are easy to cut or remove so don’t consider them adequate defense for an open window. Victims reported they left doors unlocked as they were only walking the dog, or at a nearby park with their kids and didn’t plan on being gone long. We think 9 minutes is a long time for a burglar to be in your home. Laptops, jars of coins, jewelry and tools were popular stolen items this month. One burglar entered an unlocked garage and stole the victim’s car using the valet key left in the glove box of the vehicle. On 7/30/11 people on Densmore Ave. N. were having a party in their basement and a guest came upstairs to find four burglars inside the house. They were chased outside and fled in the suspects’ vehicle. An astute individual reported 2 motorcyclists stuffing their back packs with stuff from a suitcase they later discarded. The witness gave good descriptions and even a license plate number to 9-1-1. Officers ended up arresting one of the thieves a short time later near the Home Depot parking lot. Turned out the motorcycle was stolen. The suitcases seen had the victim’s name on the ID Tags which helped verify a burglary had occurred; and most of the chase was caught on an in-car camera of the patrol car. Great work by North Precinct patrol and by the great witness who called in the Suspicious Activity which lead to the arrest. You are our eyes and ears! Johnston also said the 27th annual Night Out Against Crime on Aug. 2 was a big success, with 1,327 blocks across the city registering to participate, a 12 percent increase from last year. The big news, however, is that more than half of those – 720 blocks – were in the North Precinct, twice the number of the city’s other four precincts combined. 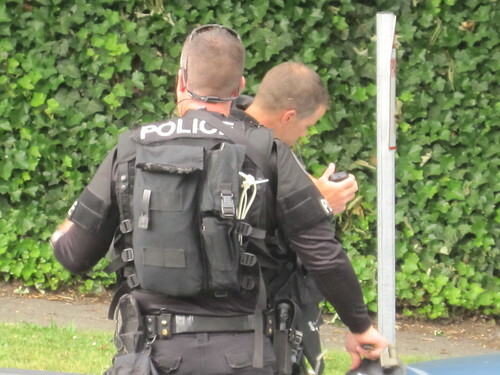 As you read about in our live updates, a Fremont man attacked his parents with a baseball bat Tuesday afternoon, leading to a stand-off with Seattle Police when he barricaded himself in the house. The stand-off, which began at roughly 3:00 pm ending around 5:30pm when the SWAT team surrounded and stormed the house in the alleyway between Evanston & Fremont Ave. at 41st St. The 52-year-old suspect is known to police for previous incidents and is described as a schizophrenic. As someone who lives in the neighborhood (right around the corner, to be exact), I can confirm that four police cars were parked on 41st St at Fremont Ave, last week due to an incident involving the man. The parent’s were able to escape without any major injury and were seen waiting outside of the taped-off area, awaiting the outcome of the arrest. No word yet on charges but the arrest seems to go off without any issues or problems. At least 15 police cars, two fire trucks and a SWAT van were present at the scene. Fremont is full of dogs. Seems you can’t walk down the street without running into at least seven of them. So it should be no surprise that they’re solving crimes for us now. On 06-28-2011, at approximately 2:51 a.m., a Canine Officer was dispatched to a Burglary call in the 100 block of N. 39th St, involving several homes in the Fremont area. The suspect had broken two windows, on two separate homes. The officer and his canine partner began their track where the caller had last seen the suspect. The track continued and the suspect was located in a backyard of another individuals home. The suspect complied with orders given by the officer and was taken into custody without incident. The 23- year- old suspect was booked for Investigation of Property Damage. Remember, next time you see a dog in Fremont, it might be working undercover. So be nice. Back on May 5th, a 23-year-old female was walking down the 4000 block of Linden Avenue N when three men starting following and harassing her. She began to dial 911 on her iPhone but one of the suspects approached her from behind, struck her in the face and stole her phone before she had the opportunity to complete the call. He fled and, one would assume, was never to be heard from again. Not so fast, buddy. The Seattle PD spent the last two months tracking him down and finally apprehended him today. Information developed during the on-going investigation which led to the identity of the 21-year-old suspect. He was presented in a photomontage and positively identified by the victim. On June 23rd at approximately 9:00 a.m., the suspect was located at an apartment in the 4200 block of 34th Avenue West and taken into custody without incident. He was transported to the Robbery Office for processing. The suspect was booked and now awaits a court appearance. A SWAT team descended on a home near 3rd Ave. and 41st St. tonight after a man inside reportedly fired shots into the air, then locked himself inside. Officers spoke to him over a loudspeaker urging him to give himself up. At one point, SWAT members fired loud flashbangs to get his attention. Just after 10:30 p.m. police took the man into custody. When the incident began around 8 p.m., police closed a wide area around the home, shutting down Leary and 3rd Ave., diverting traffic to side streets. Neighbors who couldn’t access their homes milled the streets, waiting for the police action to end.